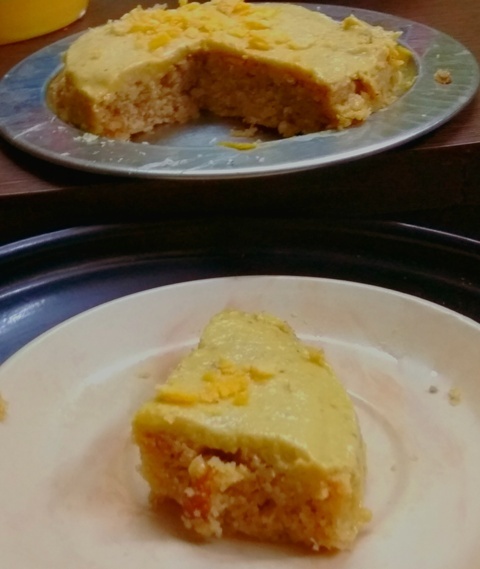 Mango cheesecake on your mind? I have never savored nor tried one before. But this time I wanted to try out something different with mango. 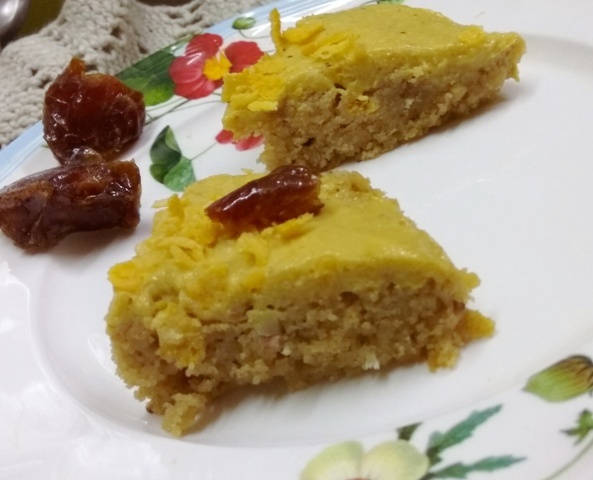 This eggless sugarfree mango cheesecake without cheese recipe is my innovation. With subtle amount of sweetness, it is one perfect bake for everyone around. Perhaps this is not a diabetes-friendly recipe, since anything sweet is toxic for type 2 diabetics. 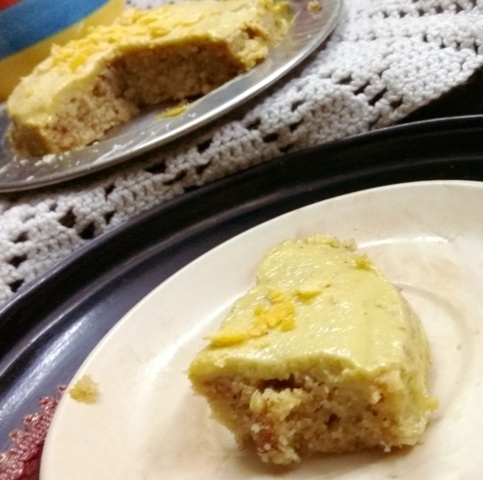 But if you exercise everyday and keep your sugar levels managed, a slice of this eggless sugarless mango cheesecake without cheese is for you. Yes, one slice won't hurt. So what are you waiting for? 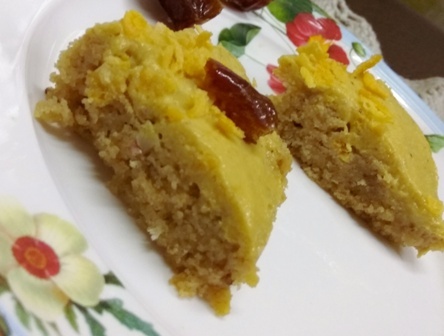 Go ahead and try out this eggless, butterless, simple cake recipe and indulge in this sugarless goodness. 1. Keep dates soaked in water for 2 hours. The pieces will get swollen and be easy to process. 2. Next de-seed dates after 2 hours and add oil and curd to the mix. 3. Whisk this wet mix. 4. Add cinnamon powder and salt. Mix. 5. Mix all the flours well. 6. Mix wet with dry ingredients. 7. Keep this mix aside for half an hour. 8. Add baking soda and vinegar/lime juice. You may add 1-2 tbsp of water or milk if you want. 9. The batter should be thick. 10. Bake in a preheated oven at 170 degrees for 30-35 minutes or until a skewer comes out clean. 11. Allow the cake to cool down completely before slicing. Add chopped mangoes along with the rest of the ingredients to a processor and churn. When the cake is done and cool, take a big bowl to cut it into a medium circle. Pour the mango topping over it evenly and keep it covered in the refrigerator overnight. 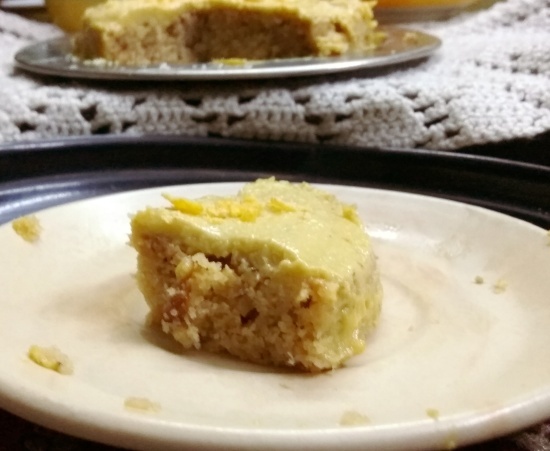 Cut into slices and enjoy sugarfree eggless mango cheesecake without cheese.